I love passing on these important values to other lash professionals through my intense, rewarding training courses — to give you the cutting-edge techniques and elevated standards necessary to build lasting clientele. You’ll learn the intricacies of applying eyelash extensions — the right way. Training is offered twice a month. You can complete this order on location by credit, debit, or cash. The lash studio is my haven. I settle for nothing less than immaculate, stunning, and beautiful eyelash extensions while providing the utmost care, sanitation, and relaxation for my clients. I love passing on these important values to other lash professionals through my intense, rewarding training courses – to give you the cutting-edge techniques and elevated standards necessary to build lasting clientele. You’ll learn the intricacies of applying eyelash extensions – the right way. I’m honored to pass along my skills and artistry so you can roll out your unique, successful eyelash extension business and career. As an active member of the women in business, I thrive on supporting and leaning into women who are energized and enlightened about starting a career in this industry. Beyond these courses, I’m a steadfast mentor and connector, to help guide you in the best way possible. Students will continue to work on their model until they feel comfortable and or the lashes are complete. This process can take anywhere up to five hours. Do I need to be a licensed Esthetician? Yes, you must be a licensed esthetician and/or Cosmetologist. Or, currently enrolled in school. Must provide documentation of license and or enrollment of beauty school. You are required to provide your own model. Must be someone 18 years or older. The model should be prepared to lie down with there eyes closed for up to five hours. Yes, a certificate of completion is awarded at the end of class. Jenna is an amazing trainer, her classes not only taught me how to apply eyelash extension but also how to start and run an eyelash extension business. Her experience really shows in her work and I am honored to have worked with her. I recommend her training if you are looking for the best eyelash extension artist out there. Jenna is an AMAZING trainer. She is very thorough, extremely organized and genuine in her approach. Her passion for the business shows in the way she instructs. She cares not only about giving you the tools and information to be successful, but also about your experience while learning. She knows the business very well and shares so many details and experiences that will truly help you down the road. I would highly recommend her! You will walk out confident and ready to go! I was very happy with Jenna even more happier that I was able to get into her class last minute. Jenna is professional and truly wants you to succeed in the lash industry. She took her time and showing us different techniques on application not to mention business tools to help you run your business. She is very educated and passionate about what she does. Jenna was beyond amazing to work with! She is very knowledgeable and kind while teaching. Her training coarse and class are a perfect way to start your lash career! She sets you up for complete success with her step by step take home guide. I have even had a few questions beyond the course, which she has been more than willing to guide me in the right direction and answer my questions! I feel confident with my clients because of the training that Jenna gave me! I am beyond thankful for the opportunities to come! Jenna’s lash training classes are amazing. Her training has not only giving me the skills to apply lashes like a professional, but also business skills to help get my career started. In addition to the application of eyelash extensions, Jenna provided the class with personlized training kits with all the tools needed for application. I would defintley reccomend her to any friends and family looking to get into the lash business. I called several schools to get as much information as I could since I didn’t want to get ripped off. Most of the places were way more expensive and only offered large group classes. LashOut was reasonably priced, and had great review. I was a first-time student at LashOut Esthetics Eyelash Training to gain experience with lash extensions. I was so unbelievably pleased with the class! Jenna was very well trained and knew exactly how to teach us. She was very knowledgeable and was able to answer all our questions. The class was fun and exciting! 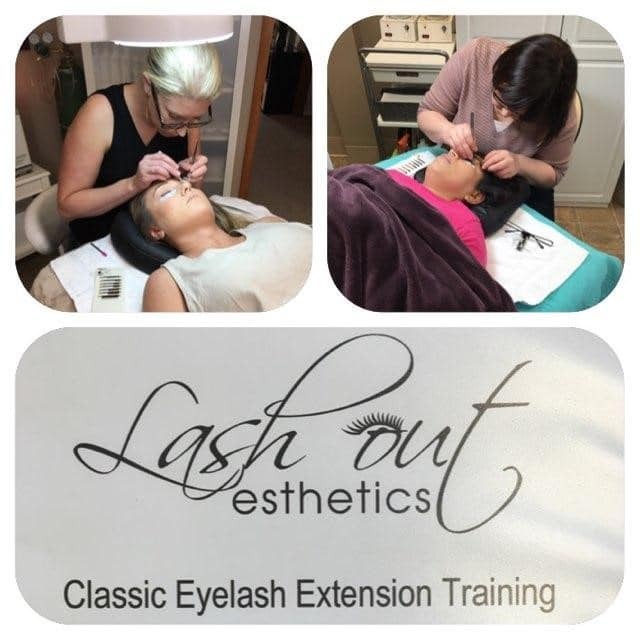 Lash Out Esthetics is the top rated Eyelash Extensions & Eyelash Extension Certificate Training, Organic Spray Tans, and Eyebrow Waxing studio in the Portland, Tigard, and Beaverton area.